Nagnajiti, also known as Satya, is the fifth of the Ashtabharya, the eight principal queen-consorts of Hindu God Krishna, an avatar of the god Vishnu and the king of Dwarka - in the Dwapara Yuga (epoch). She was the daughter of the King Nagnajita, of Kosala. Krishna competed in the svayamvara arranged by her father, and as per set rules he brought under control seven ferocious bulls by putting noose around each of them and thus won Nagnajiti as his wife. In South India, when the poet-saint Andal wrote the Thiruppavai and the Nachiyar Thirumozhi, she mentions Nappinai, the daughter of King Nagnajita. It is believed that this Nappinai is Nagnajiti. The Vishnu Purana, the Bhagavata Purana and the Harivamsa call her Satya Nagnajiti. Commentators often consider Satya as her birth name and Nagnajiti a patronymic, translated "the daughter of Nagnajit(a)". However, sometimes it is translated as Nagnajiti, "the virtuous" (meaning of the word Satya). Her father Nagnajit was the king of Kosala, whose capital was Ayodhya. Nagnajiti is described as Kosala-pati ("Lord of Kosala") and Ayodhya-pati ("Lord of Ayodhya"). The Bhagavata Purana also calls Nagnijiti by the epithet as Kausalya, "belonging to Kosala" ascertaining her role as princess of Kosala. A wife of Krishna named Satya is mentioned in the Mahabharata. The Bhagavata Purana narrates the tale of Nagnajiti's marriage. Nagnajit was a pious king who followed vedic scriptures with great devotion. The King had set condition for the marriage of Nagnajiti that her husband should win her by defeating his seven ferocious bulls in combat. However, no prince who challenged to do the task could control the seven bulls to win the hand of Nagnajiti. When Krisna came to know of the challenge, he set out for Kosala Kingdom with a large retinue. As Krishna approached Nagnajit in his court, the king rose from his throne and honoured Krishna with gifts and welcomed him warmly to Kosala. Naganjiti was also very joyful to see Krishna and prayed that Krishna be her husband. Both the king and his daughter are aware of Krishna's divinity. Nagnajit worships Krishna and asks the purpose of his visit. When Krishna declared that he wished to marry Nagnajiti, the King states that there would no better husband for his daughter, but he had taken a vow that he would marry his daughter to a brave prince who would bring the seven bulls under control. The King also praised Krishna's valour and told him that he could easily tame the seven bulls which had almost mauled the other princes who had tried. Upon listening to the king, Krishna entered the arena expanding into seven forms and easily put a noose around the seven bulls, humbling the bulls. King Naganajit was pleased with the outcome and his daughter was delighted to take Krishna as her husband. The marriage was celebrated with pomp and grandeur. The king presented Krishna with a dowry of 10,000 cows, 9,000 elephants, 900,000 chariots, 90,000,000 horses, 3,000 elegantly dressed young maids and 9,000,000,000 male servants. Finally, Krishna and Nagnajiti departed towards Dwarka, accompanied by their army to protect them. On this way, they were attacked by the princes who had lost in Nagnajit's bull challenge. Krishna's army yieled by his Yadava clan warriors and his friend Arjuna defeated the princes and chased them away. Krishna then entered Dwarka with all glory accpmanied by his wife Naganajiti and lived happily. 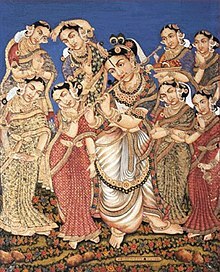 Nagnajiti has ten sons: Vira, Chandra, Ashvasena, Citragu, Vegavan, Vrsha, Ama, Shanku, Vasu and Kunti. The Vishnu Purana says that she has many sons headed by Bhadravinda. The Bhagavata Purana which describes the death of Krishna and end of his race records the leap of Nagnajiti and other chief queens in Krishna's funeral pyre immolating themselves (see sati). ^ a b Horace Hayman Wilson (1870). The Vishńu Puráńa: a system of Hindu mythology and tradition. Trübner. pp. 79–82, 107. Retrieved 22 February 2013. ^ Prabhupada. "Bhagavata Purana 10.58". Bhaktivedanta Book Trust. Archived from the original on 26 August 2013. ^ Mani, Vettam (1975). Puranic Encyclopaedia: a Comprehensive Dictionary with Special Reference to the Epic and Puranic Literature. Motilal Banarsidass Publishers. p. 704. ISBN 978-0-8426-0822-0. ^ a b Prabhupada. "Bhagavata Purana 10.58.32". Bhaktivedanta Book Trust. Archived from the original on 14 June 2014. ^ Prabhupada. "Bhagavata Purana 10.61.13". Bhaktivedanta Book Trust. Archived from the original on 21 October 2010. This page was last edited on 22 January 2019, at 23:16 (UTC).